Home to the toughest range of trade glues and glue guns around. 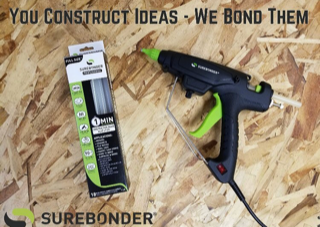 Surebonder is a family owned business that has been operating in the US for over 50 years. They pride themselves on their innovation and high quality adhesive products. The Trade arm of the company has experienced huge success in recent years with some award winning products hitting the market. And that’s where we – Shamrock Australia – take hold. We are the Australian distributor for the range – responsible for shouting out to mates near and far about these top action products. Made for tradies Australia wide. Get stuck on this! For wholesale enquiries, or to find your closest stockist – just holler!